Timbuktu is a legendary ancient city in Mali that sits around 12 miles north of the Niger River. The city has found its way into folklore and has a number of legends surrounding it. Timbuktu started out as a 12th Century settlement before becoming a part of the Mali Empire by the 14th Century. The city is shrouded in mystery, with a reputation in the West of being a city of great wealth and intrigue. By 1988, the city had been classified as a UNESCO World Heritage site, and, by 2005 it had been categorized as an endangered site, largely due to the conflict in the area. 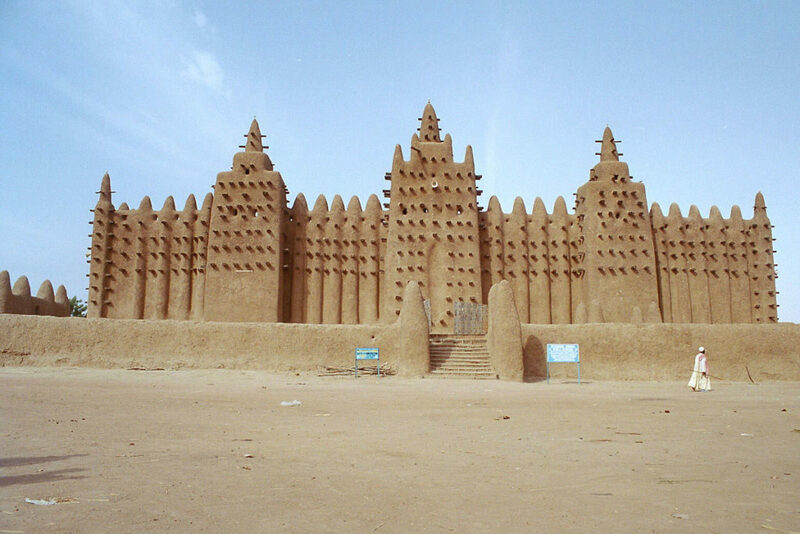 In spite of this, Timbuktu remains popular with tourists and has contributed a lot to the economy of Mali. We’re going to take a look at the story of Timbuktu and find out more about this fascinating ancient city. The city started life as a settlement but really came to prominence as a trading post on the trans-Saharan caravan route. By the 14th Century, gold and salt trade was of enormous importance in Africa, and Timbuktu was a crucial part of this trade. There was also a big slave trade history attached to the city, and this gave it status in early times. In recent times, the main source of trade has been rock salt, and Timbuktu is a pivotal trading route for this. During the 14th Century, at the height of its trading power, Timbuktu was thought to be a city of supreme wealth and status. In fact, tales of its wealth and legend grew and spread as far as Europe. This legend is thought to have been traced back to 1324 when the Malian emperor traveled through Cairo on his way to Mecca. While in Cairo, the local merchants and traders were mesmerized by the gold the emperor was carrying, and he told them all it was gold from Timbuktu. This legend was cemented when, some 30 years later, Muslim explorer Ibn Battuta wrote of a city made of gold. Such was the legend of the city that many from other continents were desperate to visit and see this mythical city of gold. There were many expeditions over the years that almost all ended in failure, and, it wasn’t until 1826 that Europe finally arrived in Timbuktu, in the form of Scottish explorer Gordon Laing. He found only a desolate, uncivilized city, with a modest salt trade. This anticlimactic experience was shared by subsequent future explorer, including Rene-Auguste Caillie, and Heinrich Barth, who later published books about it. Timbuktu is one of the most famous and iconic ancient cities in the world. Despite the recent terrorist attacks taking place in and around the city in the past few years, the city is still culturally significant. It’s a city full of incredible history and mythology, and a place you should definitely try to visit. There might be the worthy of finding it underwhelming, as Laing did, but, the sheer influence and legend of the place will make the visit worthwhile. Though not exactly the city of gold we were all hoping for, the trade history of Timbuktu makes it a hugely important city in the history of Africa.